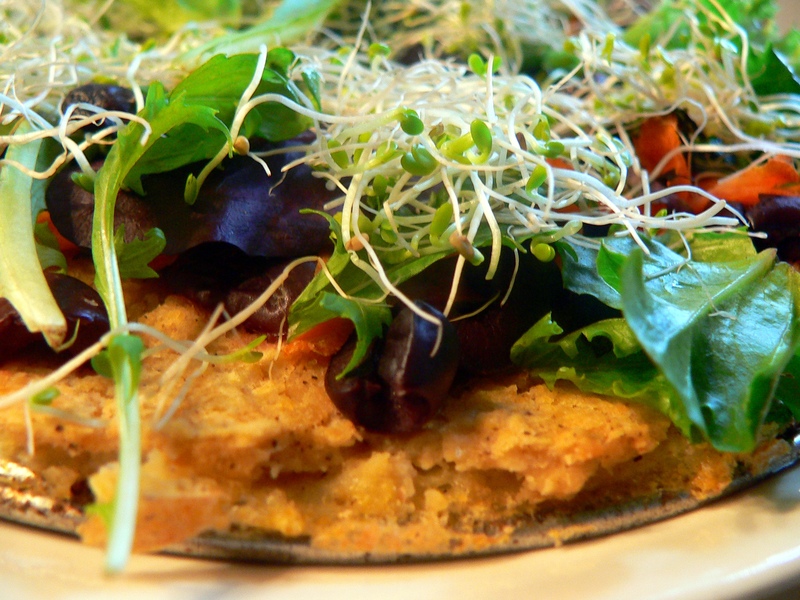 This week I made a polenta pizza with hummus, olives, salad greens, sprouts, and seaweed. It was pretty tasty and filled with yummy, healthy things. 1. Bring 4 cups of water or vegetable stock to the boil. Reduce the heat and whisk in 1 cup coarse polenta (cornmeal). Continue whisking 5 minutes. Replace whisk with a wooden soon and stir until spo on can stand and polenta comes away from sides of pan. Stir in two tablespoons of softened Earth Balance and season with salt and pepper. 2. Spread the mixture over the base of a deep pizza tray (I used a spring form pan because I don’t own a pizza pan). Set aside to cool (this step is essential, I forgot to do this and I think it messed things up a little). Brush the polenta with oil and bake in a preheated oven 400º for ten minutes. 3. Remove the polenta from the oven and spread hummus on top (now, I would suggest cooking the polenta for a little longer and making sure your hummus is room temperature, I had some difficulty spreading it). Top with olives and carrots. Bake for another twenty minutes. Then add salad greens, sprouts, and seaweed. I had a really difficult time removing mine from the pan. I think this was because I didn’t let my polenta cool down before putting it in the oven again.